To overcome the gaps in the country’s fuel cell infrastructure, China began to invest heavily in foreign fuel cell technology in 2018. Weichai Power, China’s largest state-owned diesel engine maker, purchased 20 percent stakes in fuel cell manufacturers Ballard Power Systems (Canada) and Ceres Power (UK). In its joint venture, Ballard will aim to make at least 2,000 fuel cells a year for commercial vehicles by 2021. Ceres has announced plans to jointly invest in a manufacturing facility in the Shandong province. In October 2018, FCHEA member Hyundai entered into an agreement with the Beijing-Tsinghua Industrial R&D Institute (BTIRDI) to establish a ‘Hydrogen Energy Fund’. The fund aims to spur investment in the hydrogen industry and promote the growth of startups in China and South Korea, through both equity investments and more active, systematic support. Hoping to attract investments from leading venture capital firms in China, Europe, and the U.S., the Hydrogen Energy Fund has a goal of raising $100 million. In November, FCHEA member Air Liquide signed an agreement with Sichuan Houpu Excellent Hydrogen Energy Technology to build and market hydrogen refueling stations in China. In a press release, Air Liquide noted that the agreement came in the context of the “13th Five-Year Plan”, in which the Chinese government announced their support for future hydrogen infrastructure projects. This January, Air Liquide also signed an agreement with the Yankuang Group, a Chinese state-owned energy enterprise, to further develop hydrogen infrastructure in the country’s Shandong Province. Shandong, the leading coal producing province in China, can recycle up to 962,000 tons of hydrogen from industrial exhaust gas each year, according to the provincial development and reform commission. Wan Gang, known as the father of China’s electric vehicle industry, is now urging the Chinese government to shift their focus towards the development of fuel cell vehicles. After years of leading the charge for lithium-battery electric vehicle subsidies in China, Wan cited quick refueling time, extended driving range, and zero emissions among reasons to pivot towards fuel cell vehicle development, in a December op-ed . In December, the district government in Fuyang signed a cooperation agreement with FCHEA member Nuvera Fuel Cells, LLC, a Massachusetts-based provider of fuel cell power solutions, to begin manufacturing fuel cell stacks beginning in 2019. The local production of stacks will allow Nuvera to power zero-emissions heavy-duty vehicles, which make up nearly 10 percent of China’s on-road vehicle fleet but account for close to 50 percent of fuel consumption. The Chinese government has targeted the reduction of national heavy-duty vehicle fuel consumption by 19-29 percent by 2021. Nuvera Fuel Cells also entered into agreement with Zhejiang Runfeng Hydrogen Engine Co., Ltd. (ZRHE) to manufacture fuel cell engines for use in China’s “New Energy Vehicle” market. 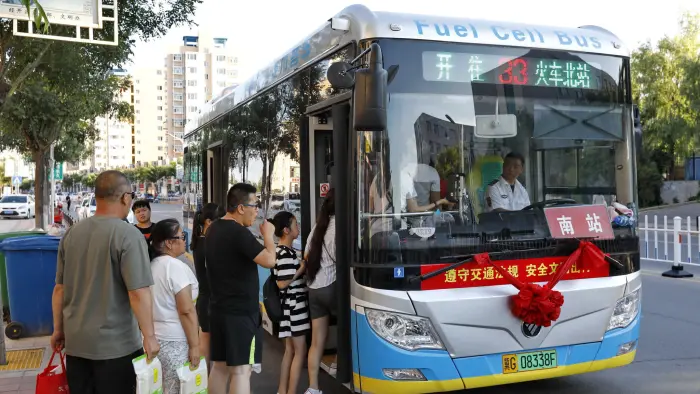 The agreement utilizes Nuvera’s current generation fuel cell stacks to manufacture 45kW engines for transit buses, delivery vehicles, and other mobile applications in China. This cooperative opportunity allows Nuvera to aid China in the pursuit of its aggressive targets for deployment of FCVs. As China continues to promote its fuel cell industry, FCHEA member Anglo American is expecting a rise in platinum demand with assurance that the country will support fuel cell investments for years to come. Anglo American, a leading platinum producer, could see a new market for 500,000 ounces of platinum as a result of Chinese fuel cell investments, according to Benny Oeyen, Anglo American Platinum’s head of marketing. Most recently, the Chinese government announced plans to promote fuel cell vehicles in a number of prominent cities including Beijing, Shanghai, and Chendu. The program will be modeled after their “Ten Cities, Thousand Vehicles” project, launched in 2009 to promote battery electric vehicles. With total state investment in fuel cell technology reaching about $12.4 billion in 2018, China is clearly acting upon their commitment to national clean energy goals, as well as their Fuel Cell Technology Roadmap. The true test of the country’s hydrogen potential will come once the enormous local and national subsidies level off, but officials hope that the subsidy tap will mirror state investments in other renewable resources, bringing leading companies and capital into new markets.